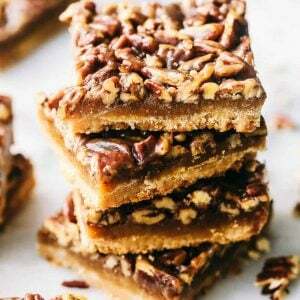 Best Ever Pecan Pie Bars takes the amazing pecan pie and transforms it into irresistible bars. A buttery shortbread crust that gets topped with a caramel pecan glaze, these are perfect for feeding a crowd! 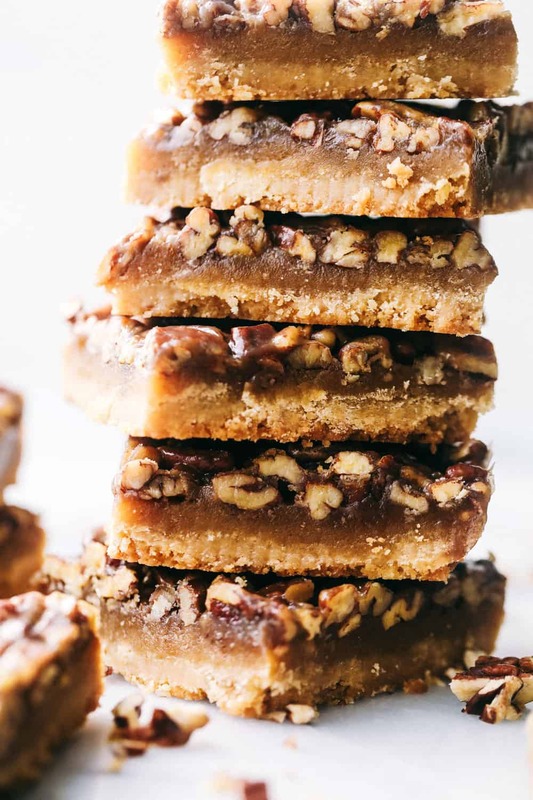 These delicious bars were one of the first things to make it to the blog! 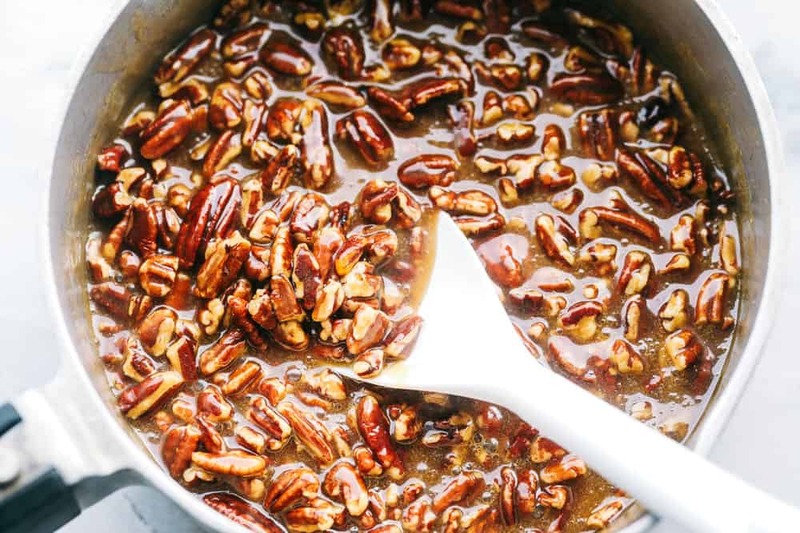 And they have always stood out as one of my favorite recipes, especially because I love pecan pie so much. 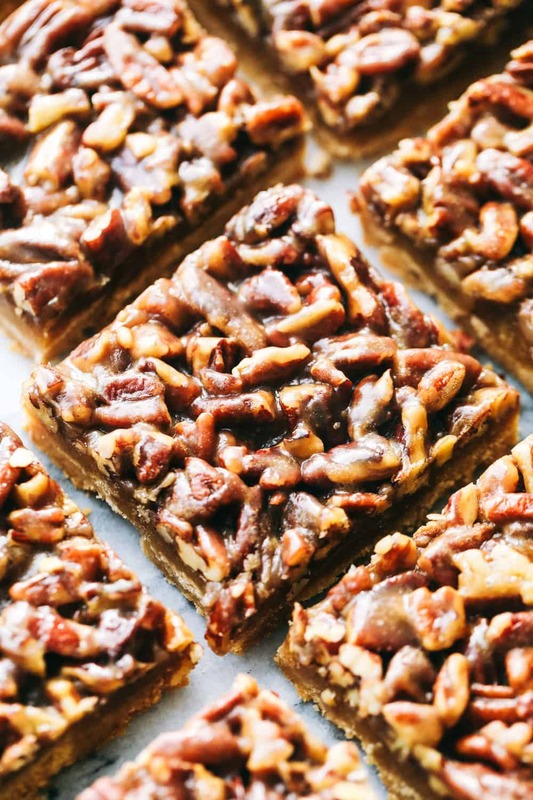 I have had a lot of pecan pie bars and I can assure you these are the very best. 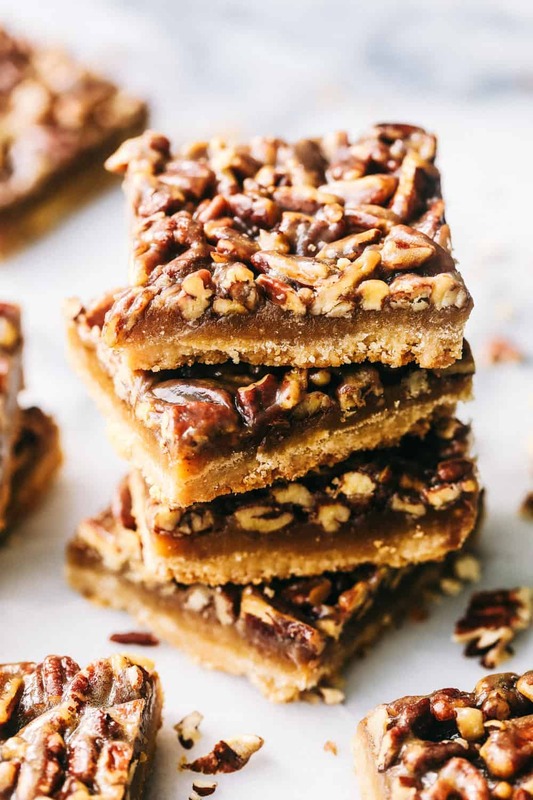 Some pecan pie bars crack at the top, but these turn out perfect every time. They are perfectly soft and chewy and the buttery shortbread crust is to die for. Whenever I take these to a gathering they are the first thing to go. Everyone raves about these bars and I know that you will agree that they are the BEST! You have to make them this holiday season! 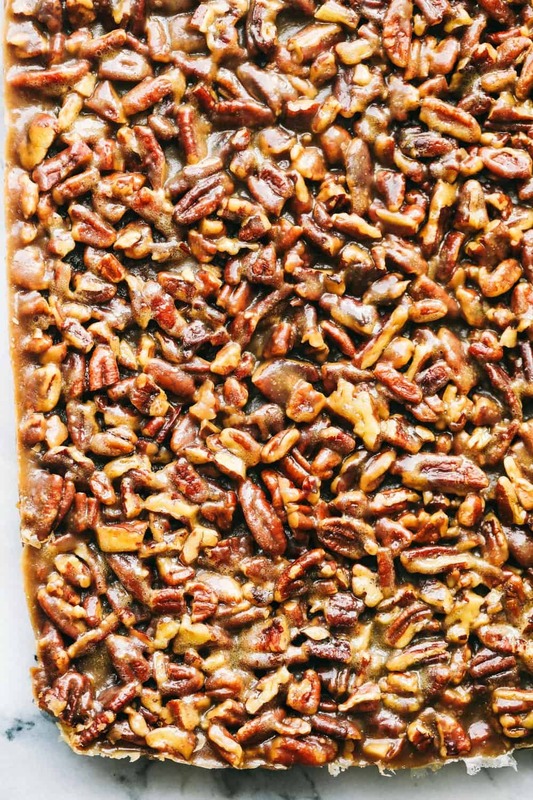 How do you make pecan pie bars? Start by preheating your oven to 350 degrees. Line a 9×13 inch pan with aluminum foil or parchment paper leaving a 2 inch overhang. This makes clean up a breeze. 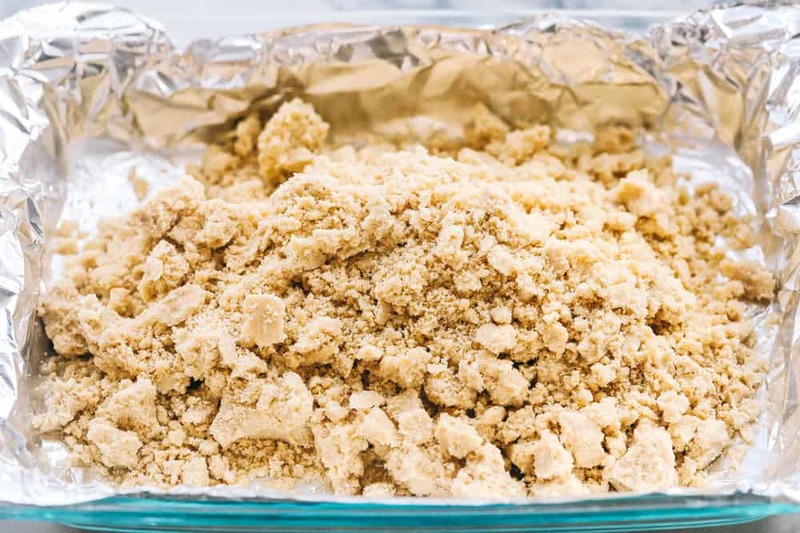 Make the crust by creaming together the butter and brown sugar until fluffy in a stand mixer. Add in the flour and salt and mix until crumbly. Press the crust into your 9×13 inch pan. Bake for 20 minutes or until golden brown. While the crust is baking, prepare the filling by combining the butter, brown sugar, honey and heavy cream in a medium sized saucepan. Stir over medium heat for about a minute and stir in the chopped pecans. 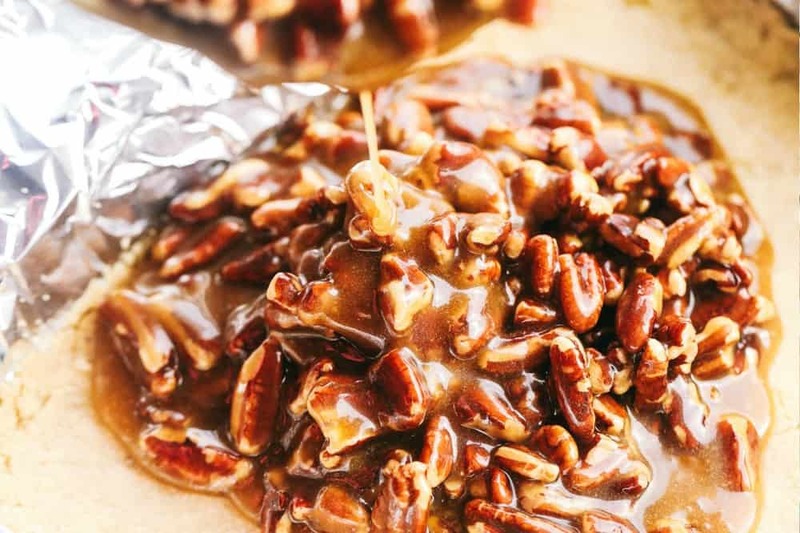 Remove the hot crust from the oven and pour the pecan filling on top spreading it over the surface. Return to the oven and bake for an additional 20 minutes. Let the bars cool completely before cutting. Lift the bars out with the foil and peel the foil off the bars. Slice and serve. Store in an airtight container. Yes. Make sure to store your bars in the refrigerator in an airtight container once they have cooled. This will help to prevent foodbourne illness from happening. Yes. Pecan Pie Bars freeze great! Let it cool completely, wrap tightly and freeze. Let the bars thaw completely in the refrigerator, and then you can also revive them by putting them in a low oven for 20 minutes. Looking for even more delicious dessert bars? Look no further! Preheating your oven to 350 degrees. Line a 9x13 inch pan with aluminum foil or parchment paper leaving a 2 inch overhang. Make the crust by creaming together the butter and brown sugar until fluffy in a stand mixer. Add in the flour and salt and mix until crumbly. Press the crust into your 9x13 inch pan. Bake for 20 minutes or until golden brown. While the crust is baking, prepare the filling by combining the butter, brown sugar, honey and heavy cream and vanilla in a medium sized saucepan. Stir over medium heat for about a minute and stir in the chopped pecans. 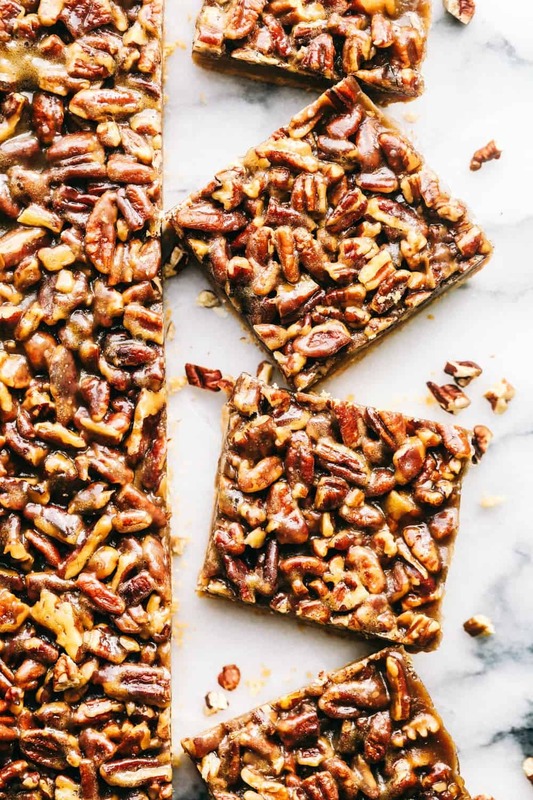 I love pecan pie so I have to try making these bars! Oh, I love pecans! Thanks so much for linking up to Thursday Food Fest! Oh these sound delicious! I love Pecan pie, and this looks just as good!!!! YUM!!! Thanks so much for checking out and leaving a comment on my little blog. Your site looks amazing! I’m a definite regular now! 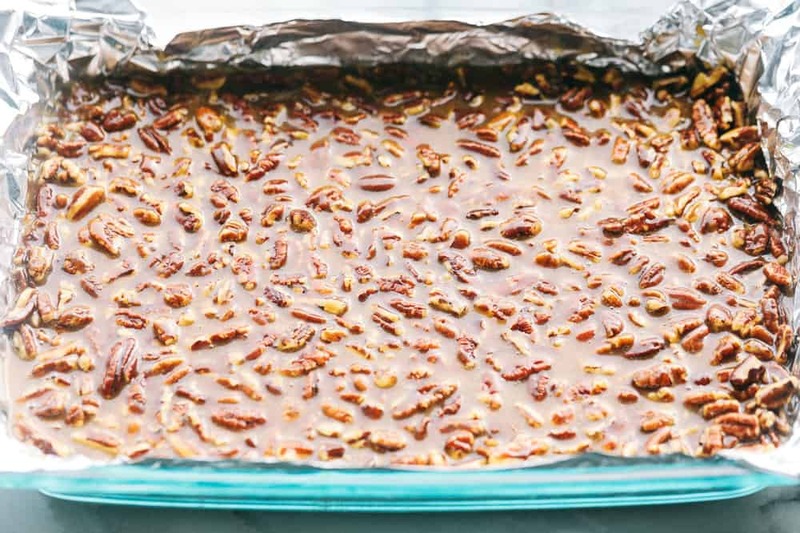 I recently made some pecan pie bars and they have become a new favorite recipe! These went over big with my family!! Lots of compliments…. The only thing I did different was to add a teaspoon of vanilla extract to the batter and the caramel sauce. The cookie base was a bit drier than I like so next time I am going to play with less flour, more butter or less cooking time. Made a double batch on the weekend for an event and it was a hit! I did everything exactly the same however I only had 3cups of pecans for both batches as opposed to 2 cups each and it was still great! A keeper! They actually might be ok to mail. They don’t get hard like brittle but harden enough. They still are soft to bite. Sorry I hope this helps! Haha. They are delicious! If I use raw honey, would the amount still be the same? Do you think I could adapt this to use a mini cupcake pan instead of doing it as.9×13 pan? I would like small individual servings for cookie trays. I forgot to buy heavy cream for this recipe, can I use half n half instead? Approximately how many bars does this recipe make? Thanks! I just made these and they are phenomenal! I sprinkled chocolate chips on half and used a little vanilla extract with bourbon in the filling. I also opted to use salted butter since I feel it cuts the sweetness. Really really great recipe! 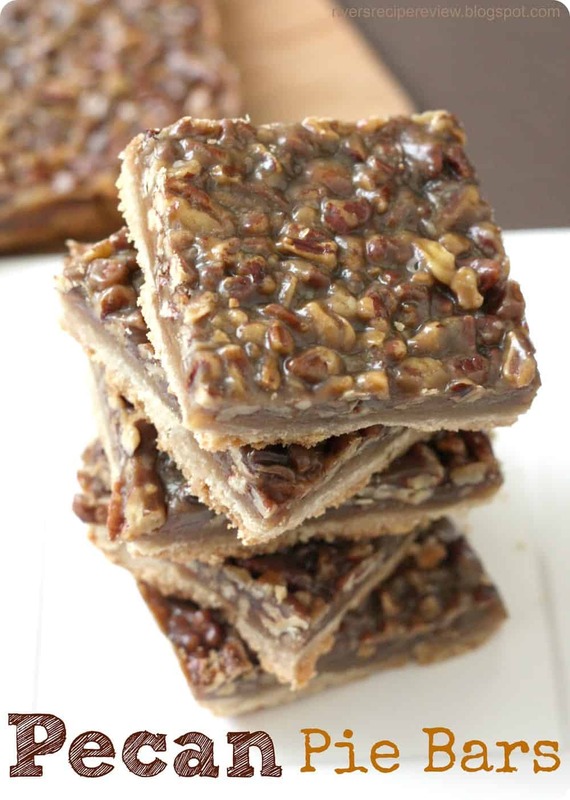 Pecan bars look delicious for Christmas giving. How do I make ahead of time and make sure theyre still great for giving? I’m so happy to receive this recipe on this site, I’m new to the site and I’m a home cook and baker. I will be making this wonderful desert for a function at my church. I’ve already told some of the church members what I’ll be making and they’re already licking their lips. What brand of salt do you use. Morton? Diamond crystal?Thanks! It depends on which one I grab for the recipe. haha. They are all great! These are absolutely the BEST EVER! I’ve made these several times and can’t get enough of them. Better than pecan pie! Simple enough to make too. I usually do not leave comments but I have to let you know these are some of the best bars I have ever had. Absolute amazing!!!!!!! Thank you. That is awesome! Thank you so much! I am so glad that you loved it! Thank you for sharing and following along with me!